I bought this during Marlo's twentieth (20) anniversary celebration and I am not disappointed. I mixed together the medium 4 and deep together and the color was perfect. Thanks Jay for listening to us and putting something together that we can use. Great product. 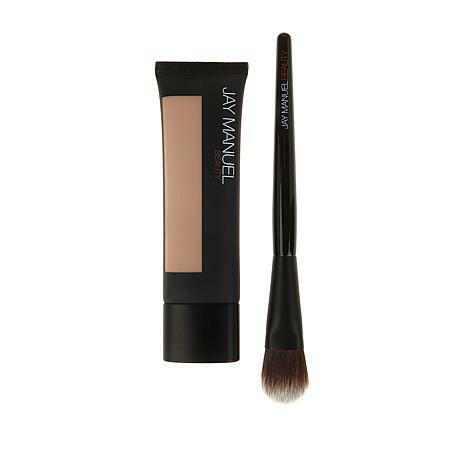 Easy to apply with the brush that isincluded. Not cakey but a smooth look even for older women like me. I need to return only because of my age. This product is very good , it does bring out my lines. That not this product fault. LOL, it's Mother Nature fault. Love this! This is my 3rd tube. Coverage is great. I only need to use a little bit and it goes far. It feels so light on my skin. His brush is my first foundation brush & I dont know how I applied makeup w/o it. I sold high end cosmetics at NM and have used very expensive foundation. This is the best. Hands down. Dont need concealer. I dont like the new container. It seems like the makeup leaks out. Its the only flaw and its minor. During Mario's anniversary celebration I learned about this makeup from Jay and I really love. I get a lot of compliments about the smoothness of my skin.